I love to decorate for the different holidays & Valentine’s is no different. Today I put up most of my Christmas decorations, I am still waiting on the towels to come out of the dryer & Adam to take down the outside decorations, but other than that everything inside is taken down, boxed up & put under the house. After taking down all of my Christmas stuff it’s time to start decorating for Valentine’s. This year my set up on our entertainment center is a little different, but I really like it. For months I have been looking for some cute skirts for the girls without any luck. I finally decided I am just going to make them some skirts. I found a simple pattern online & decided I’d use it for the first few skirts. I bought some black with pink swirl fabric, some red with peace sign fabric, some solid pink fabric & some brown with pink & green polka dot fabric. For the first skirt I used the black with pink swirl fabric and put some trim across the bottom of pink ribbon with some black stitching. I really hope Alyssa likes it. Now to start on the red with peace signs that Taylor picked out. Last March during mine & Adam’s honeymoon we saw these cute pillows in a store called tooth fairy pillows. I told Adam I can make that. They were really cute with a fairy on the front. Then here recently I saw a pin on pinterest of a really cute tooth fairy pillow that I repinned & every time I get on pinterest I see it so I finally decided to make it. The pin actually wasn’t instructions but a link to an etsy store but I went ahead & made my own tooth fairy pillow with some cute fabric I recently found on clearance at Hobby Lobby. I messed up on one of them so one of the pink ones doesn’t have a ribbon but I still thought it was cute. For those of you who don’t know, I love to journal. I have a private journal that I write in from time to time. Not as often as I use to but if I have something on my mind, if something is bothering me, if I want to remember something then I write it in my journal. Luckily I married someone who respects me enough that I can still keep my journal on my headboard & he will not snoop in it. My love for journaling was passed down to Alyssa. She loves a notepad & is always asking for more of them. Recently her & I discussed starting a journal to talk to each other about things. Sometimes it takes a little prying to get her to open up but she doesn’t have the issue when it comes to her journal. For Christmas she got this really neat journal that is made for a Mom & Daughter to write back & forth. It has pages with different questions for you to learn about each other and it has some free pages to write things that you need to talk about but don’t know how to say. When Alyssa got the journal she decided we need a special pen to write in it. Her request was a pink glitter pen. Today when I was in Hobby Lobby I looked for a pen and ended up buying a pack of glitter pens so now we have 6 different colors. I also knew we needed a cute way to keep the pens with the journal so after looking around, I found this super cute bag. I decided some iron on letters would make it perfect. Now we have a cute bag, cute pens & a really cute journal to share stuff with each other. I can’t wait to start this experience with Alyssa. We still have to decide the “rules” for our journal & she wants me to put them on a sheet to keep with the journal so it will be few days before we get started. I do know one rule is we don’t share what is in the journal with anyone else. It’s just between us! I look forward to hearing how things change over the years, see how her handwriting changes & learn things about her she doesn’t normally tell me. The other two have also showed an interest in the journal so hopefully it will also be something I can one day do with each of them. Our family defiantly had a great Christmas time with all our celebrating. We started on the 11st with Adam’s Mom, grandfather, brother, sister-in-law and three nieces. The kids always have a great time getting together with their cousins and playing. Everyone came over to our house, we ate, opened presents and just spent time together. On Thursday the 22nd we went to Adam’s Dad’s house with his Dad, Melanie, brother, sister-in-law, three nieces, aunt, uncle and other siblings. We ate, opened presents and hung out. I was really impressed by our children. They were three hours late getting in the bed and all three did really good. On Friday the 23rd we went to my Granny’s house with my grandparents, aunt & uncle from Texas, cousin from Texas, aunt & uncle from here, sister and her boyfriend. We ate, opened presents and had a good time. It was nice to see my aunt and uncle I haven’t seen since I was pregnant with Noah. On Saturday the 24th we went to my parent’s house. When I asked my Mom who all was going to be there she said “just us”. My parents have five kids so “just us” is 21 people. But I know they enjoyed having all five of us their with our families. We ate, opened presents and hung out. On our way home we went by Palisades Park but they are closed on Christmas Eve so we didn’t get to see any Christmas lights. I didn’t think about it till last night but as warm as it has been this year Zoo Light Safari wouldn’t have been that cold, but with me not being able to walk a lot like that it really wouldn’t have been possible. After four family parties, I thought our three had made out with plenty for Christmas, but I guess Santa thought they still deserved more. I know they still have tons of stuff to play with that hasn’t been opened, put together, etc. I guess it must have been those cookies they left him with soooooo much icing!! I hope everyone had a Merry Christmas!! I know I did but I am ready to slow down a little bit. The last night Elfy was here he moved Rhino’s stocking up to the hook on the ceiling, tied a string to himself and attached a note to the other end of the string. 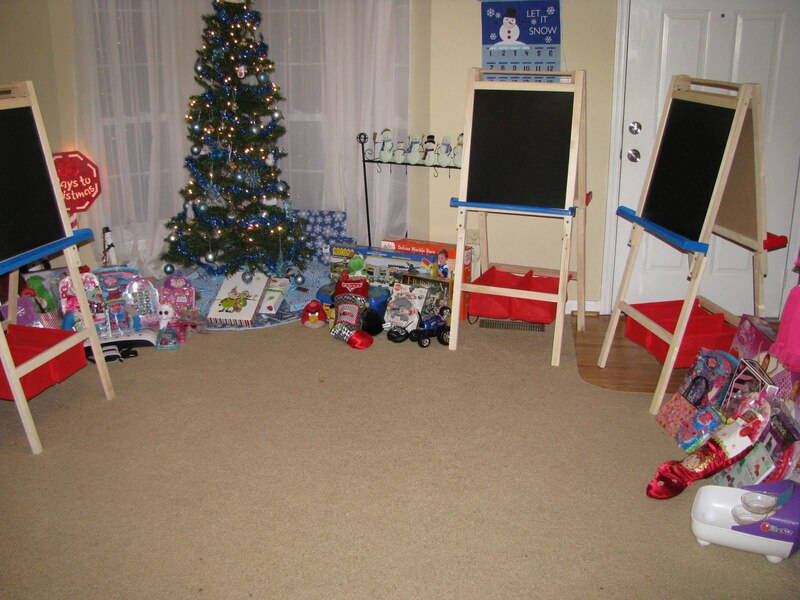 He opened all the kids’ dresser drawers, the kitchen cabinets and the doors on the entertainment center. 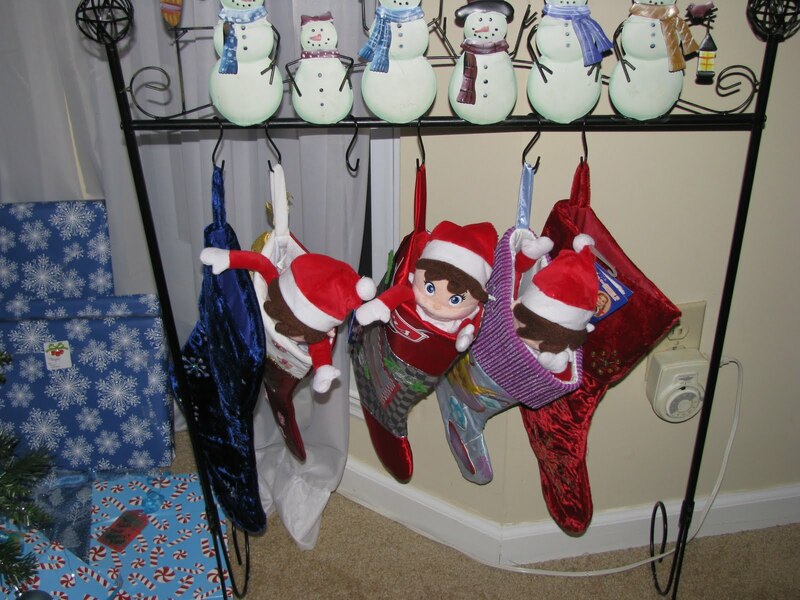 He also left each of the kids a surprise in their stocking…an elf that they can each touch and sleep with like they have been asking for. 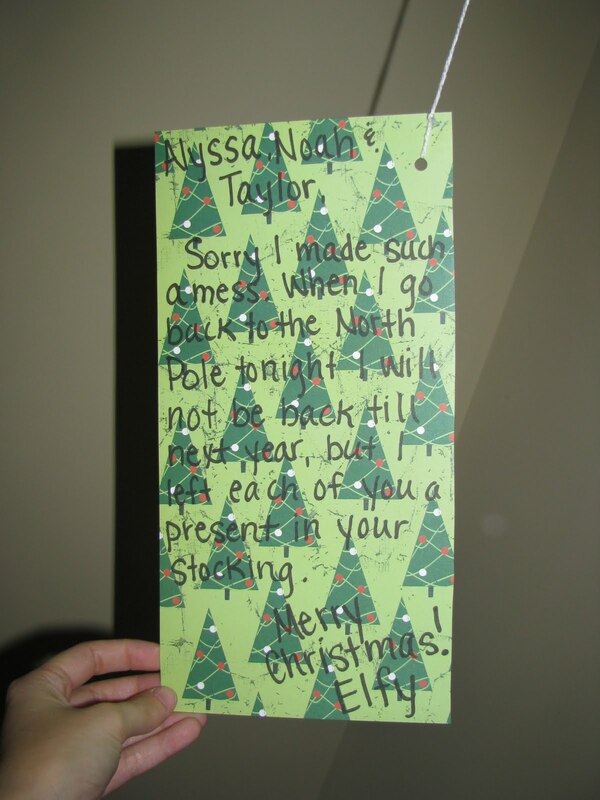 Alyssa named hers Elfyette, Noah named his Harry Potter and Taylor named hers Diamond. They are all sad to know Elfy is gone till next season but they all seemed to really enjoy him being here. 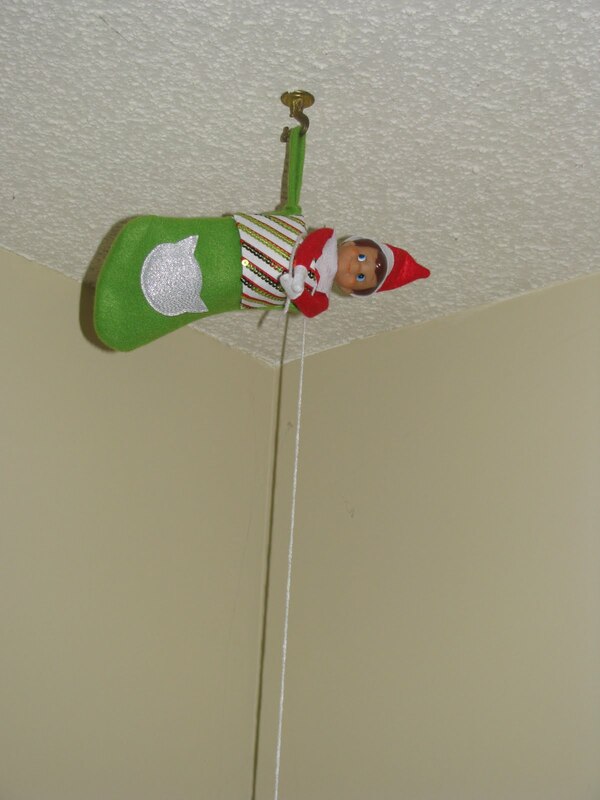 This morning the kids woke up to find Elfy took down all our Christmas cards, flipped over some decorations, got the bells off the doors & used the bells to make him a skirt. 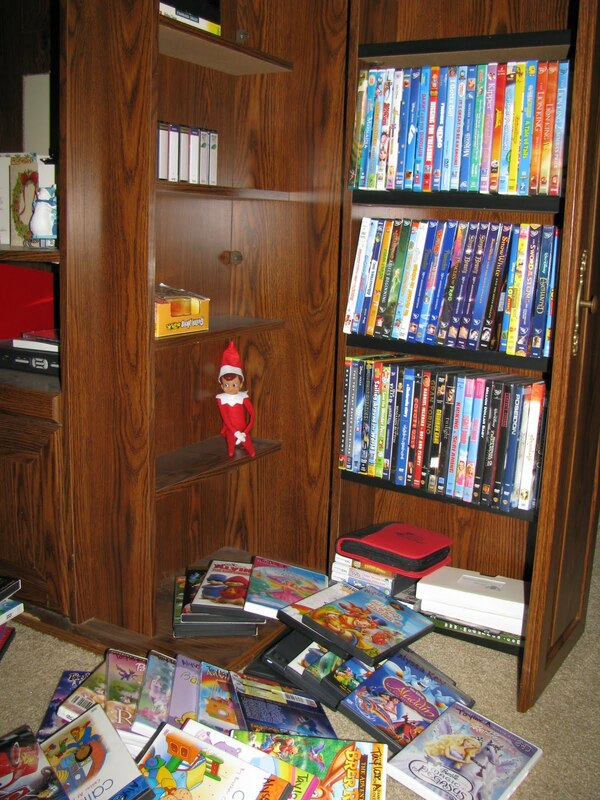 On the ninth day the kids woke up to find Elfy got in the cabinets of the entertainment center and pulled out some DVDs.